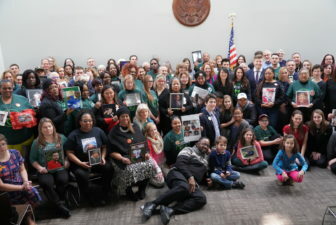 Family members and friends of gun violence victims gathered Thursday to mark the six year anniversary of the shooting at Sandy Hook Elementary School. Washington – Every year gun control activists from Newtown gather here to condemn congressional inaction on legislation they think will keep Americans safe. This year the mood at the gathering was quite different. There were still tears and emotional stories as family members and friends of victims of gun violence spoke passionately of the need for stricter federal gun laws. But the midterm elections, which wrested control of the U.S. House from the GOP and sent new members who ran on the issue of gun safety to Congress, has infused optimism into a movement that took off after the massacre of 20 first graders and six educators at Sandy Hook Elementary School six years ago. “This election was more than a referendum, it was a very strong message by the American people,” said Sen. Richard Blumenthal, D-Conn, after a press conference Thursday organized by the Newtown Action Alliance to mark the six year anniversary of the Connecticut school shooting. Buoyed by the election results, gun control advocates are dusting off dozens of bills that have failed to move in the last few Congresses, largely because Republican leaders have ignored the issue. Republicans, including House Speaker Paul Ryan, have argued that gun violence is a manifestation of mental health problems and that there are already adequate gun control laws on the books. But now Democrats will seize the reins and plan to press for votes on measures that would tighten federal gun laws after the new Congress begins work in January. Once ignored, key proposals, including the expansion of FBI background checks of gun purchasers, are now likely to pass the U.S. House with its new Democratic majority. That prediction was echoed by the advocates at the Newtown Action Alliance event. Other bills that will be keyed up for votes include legislation to increase funding for research on gun violence at the Centers for Disease Control and Prevention, bans on “bump stocks” that allow the rapid firing of rifles and “3-D” guns made with special printers, and limiting magazines to no more than 10 bullets. 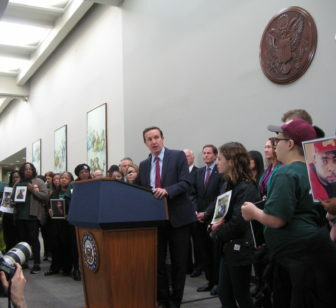 Sen. Chris Murphy addresses gun control advocates who gathered Thursday to mark the six year anniversary of the Sandy Hook Elementary School shooting. Sen. Chris Murphy, D-Conn., said the midterm election proved gun control is a winning issue, as Democrats running on tougher gun laws knocked off Republican incumbents in Texas, Georgia, Colorado and other states. Rep.-elect Lucy McBath, D- Ga., is among those incoming freshmen who ran on the issue and defeated a GOP incumbent. McBath’s 17-year-old son, was shot and killed following an argument at a gas station about loud music. The same strategy worked for Rep.-elect Jennifer Wexton, D-Va., who repeatedly bashed her Republican opponent, Rep. Barbara Comstock, for her “A” rating from the National Rifle Association. “This is a winning issue everywhere,” Murphy said of gun control. Dozens of family members and friends of gun violence victims attended the press conference – and a Wednesday evening vigil at a Capitol Hill church. They included Mike and Kristin Song of Guilford, whose 15-year-old son, Ethan, accidentally shot and killed himself, and the Rev. Sam Saylor of Hartford, whose son Shane was also shot and killed six years ago. Wearing green Newtown Action Alliance T-shirts with the slogan “Honor with Action” on the back, the advocates are not waiting for the next Congress to begin their work. They fanned out Thursday to visit congressional offices to lobby for gun reform. Despite the optimism that Congress may finally act, Murphy cautioned “no social movement has succeeded overnight.” He also said gun control legislation approved in the House may face obstacles in the Senate. While Democrats won control of the House in last year’s election, the Senate remains under Republican control. The GOP even picked up two seats in that chamber during the midterm. “We won’t get the votes to get everything we want passed in the Senate,” Murphy said. He said he will re-introduce “extreme risk” legislation, also known as a “red flag” bill, in the next Congress. Connecticut was the first state to adopt this type of law, which allows law enforcement officials, family members and friends to seek the confiscation of weapons from someone they fear is a risk to themselves or others. Co-sponsored with Sen. Lindsey Graham, R-S.C., who will head the Senate Judiciary Committee in the next Congress, Blumenthal is confident national “red flag” legislation, as well as other bills banning bump stocks and 3-D guns, will pass the U.S. Senate. “The election is a sign of coming attractions for the NRA,” Blumenthal said. The NRA took a battering from Democrats and teenage survivors of mass shootings like the one in Parkland, Fla. in the last election. Relying heavily on funding from gun manufacturers, the NRA has also suffered from a slump in gun sales. The nation’s largest gun rights group is still a powerful force on Capitol Hill, however, and claims to have 5 million members.